Location-based reminders is a quite smart feature available in MyLifeOrganized. It's here to ping you on the right spot where your task can be completed. It means that if, for example, you set the start date for the task in the future or if your task still depends on other open tasks in your list, or if the assigned context is closed now – the task is not an ‘Active Action’ and you will not get a reminder when you are at the specified location. This will help you to receive alerts only about task which are really ready for your attention. The list of all conditions considered to identify the task as an ‘Active Action’ provided in the help for MLO-Windows. In MLO each context location has the radius property. 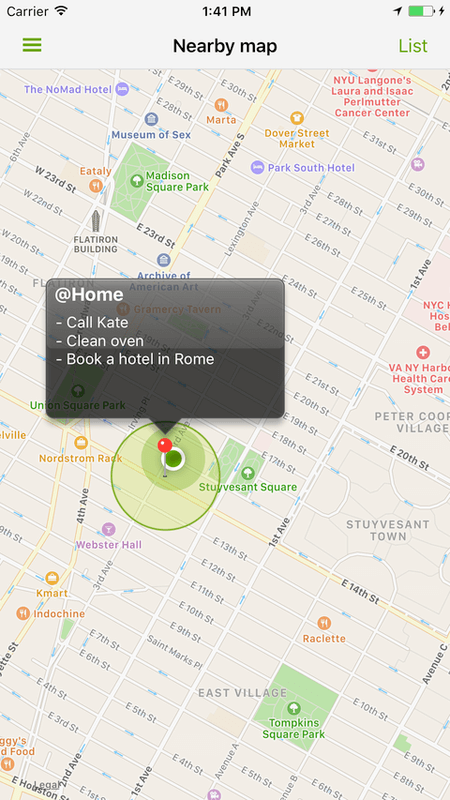 The location based alert will be shown when your current location identified inside the radius of a context. The default radius for the new context is 100 meters. So you will see the alert for the active tasks only when you are 100 meters near it (considering the precision used by your device to get the location). Adjust the radius of different contexts to better suit your needs in different situations. For example you may want to get all alerts about things to do in the other city when you have a trip to it. Just set the radius for all contexts in that city to 10-30 km and you will get alerts about all tasks in this city when you arrive to it. You can see your tasks on a map in MLO. Just click Menu->Map in the NearBy view. When you see your NearBy view on the map you can tap a pin to see the Active Actions associated with it. On the map you can also notice three types of circles (radiuses) used in MLO for location based functionality. Let’s explain how they are used. The Context radius used to get alerts when your current location is inside this radius (as explained above). This circle has green colour around a context (default 100 meters). The NearBy radius configured in MLO settings and used to include tasks to NearBy view (default 30 km). This circle is transparent grey. When context with its radius included into NearBy radius the tasks are included to NearBy view and the context pin is highlighted. The colored location precision circle shows the precision used by the device to identify your location. The precision depends on the method used to get your location by the system (Cell/WiFi or GPS) and current conditions. It may be several meters or kilometres. The contexts will be included to NearBy view if context’s radius (a) included to NearBy radius (b). You will get an alert when your location precision radius (c) included to the context radius (a).